When Gurpreet Singh Sandhu was shown a straight red card for taking a swipe at FC Goa striker Ferran Corominas last week, many had thought that this might become a defining moment in a negative way for Bengaluru FC's ISL campaign. Sandhu was given a suspension and a fine whereas the Blues no.2, Abhra Mondal was out with a hamstring injury. And on stepped Lalthuammawia Ralte! A before time return from his ligament injury meant that Ralte was straightway called into the action by BFC in their last match against North East United. And what followed next has given the league a new player to look forward to. Bengaluru FC won the game 1-0 thanks a goal from Miku but the real star of the game was none other than their custodian, Ralte. Ralte has had an association with the Blues since 2014 when the then I-League champions signed him up after his successful stint with Shillong Lajong. The shot stopper had three successful campaigns with Shillong where he made 40 appearances. In 2014, he became Bengaluru FC's number one custodian and played in every I-League game that season. Ralte was also seen in action at the Federation Cup and also in the AFC Cup. Until 2016, he was the club's numero uno custodian until Amrinder Singh emerged on the scene. He was then sent out to North East United on loan but could not find a starting berth ahead of TP Rehnesh. When the draft pick happened, Bengaluru were the first club to make a move for Ralte as the management wanted almost all the players that were a part of the setup under Albert Roca in the previous campaign. Roca was keen on working with Ralte again which is how the Mizo goalkeeper got his move to the Blues. Coming back to the game, against the side that he had represented in the previous season, Ralte was truly at his best. He made as many as 6 saves against North East United who were making regular inroads, playing at home against the Blues. The Highlanders tried everything from playing down the middle or delivering crosses into the box, but Ralte was upto the task in every possible way. He was solid for the dangerous crosses in his box and punched the ball out of danger on three occasions. He also made one crucial clearance when the defence was bypassed and Ralte had to sort the issue in a one on one situation. Along with that, Ralte also was the first line of attack for the Blues and had a decent passing accuracy of 79%. It has to be said that from being a huge prospect to playing second fiddle to Amrinder Singh and TP Rehnesh to winning a game for Bengaluru FC in the ISL, the 25 year old has come a long way. 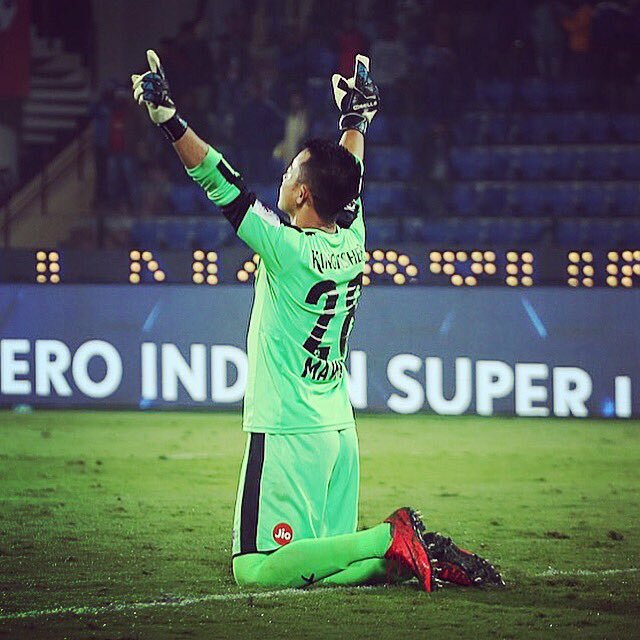 And in just one match, Ralte has shown that he has all the tools needed in the box to challenge Gurpreet Singh Sandhu for a regular starting berth.